The opinion of lawyers working for California’s lawmakers became clear in the spring. Without new laws, the state’s prominent cap-and-trade program would be dead after 2020. Such a legal reality could put an end to the pollution reduction program, and with it billions in anticipated revenues and some of the Golden State’s vaunted global leadership on climate action. Four months after the legislators’ law office concluded “the plain language” of state law dictates that the state’s cap-and-trade program “may not be applied or used” after 2020, officials in Gov. Jerry Brown’s administration are publicly ignoring the vexing legal questions affecting the flagship program’s future. Under a proposal prepared this month by the California Air Resources Board, the cap-and-trade program that it oversees would simply continue operating beyond 2020 — without lawmaker blessing. California’s cap-and-trade program was launched in late 2012, immediately becoming one of the world’s highest-profile efforts to cap the amount of climate pollution released by an economy. Permits to release some of the allowed pollution are called allowances, and they’re auctioned off, then traded among large polluters and speculators, raising funds for state programs. The results of California’s biggest cap-and-trade auction yet, which was held electronically Tuesday following the flop of a May auction that fell hundreds of millions of dollars short of expectations, may provide clues as to whether polluters expect the program to survive into 2021. Even as California officials are outwardly nonchalant about the profound legal challenges, behind the scenes they are scrambling to find solutions, quietly consulting outside experts as they attempt to unearth a regulatory fix that could bypass lawmakers without falling afoul of existing law. The Sacramento Bee reported Monday that Brown’s office may amend high-profile climate legislation to extend cap-and-trade. For now, though, state officials are simply denying to the public that a legal problem even exists. The cap-and-trade program was created by a 2006 climate law, AB32, which stated that the “market-based” system for achieving pollution cuts was “applicable” until the end of 2020. The law requires that state officials “make recommendations” to lawmakers for reducing greenhouse gas emissions after that time. Because of a proposition passed by state voters in 2010 regarding fees and taxes, lawmaker approval of a new or extended cap-and-trade program may require a two-thirds majority. The board published a 334-page proposal this month to extend cap-and-trade beyond 2020. It will be debated by the board’s directors next month. The proposal doesn’t provide anything resembling a detailed legal defense. Instead, it notes that “the intent” of the legislature was stated in AB32 as being to “maintain and continue reductions” in climate pollution after 2020. Young said the board’s legal position was “developed following a thorough review of the law by our lawyers.” Requests to interview lawyers or review detailed legal briefs were declined. 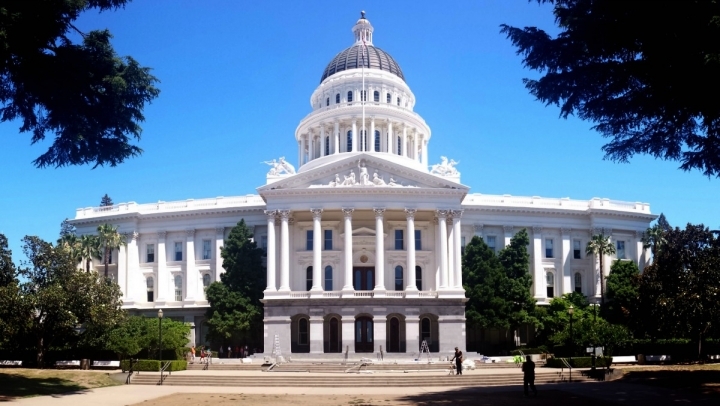 Doubts over cap-and-trade’s future are coinciding with long-running legislative battles in Sacramento over efforts to enact California climate laws affecting the period after 2020. Some lawmakers are pushing to require greenhouse gas emissions in the state be reduced to 40 percent below 1990 levels by 2030 — similar to plans adopted last year in the European Union. The legislation is strongly supported by Brown. The battle over cap-and-trade, though, is more confounding than the battle over California’s climate targets. While California’s climate targets would require simple majority support from lawmakers, extending cap-and-trade may require supermajority support. That’s because the cap-and-trade program charges fees, meaning it may be subject to the requirements of an anti-tax proposition endorsed by state voters in 2010. Another shortfall during Tuesday’s allowance auction could indicate that the entities that are regulated by cap-and-trade in California — fuel refineries, factories, power plants and the like — have little confidence that the program will survive into 2021. “If you have another very poor auction, I think what it tells you is that compliance entities lack certainty about what’s going on,” said Dan McGraw, an expert on U.S. carbon markets at ICIS Tschach Solutions, which provides market intelligence. Various theories explain why most of the pollution allowances went unsold during the last auction, which was held in May. There may be many more allowances on the market than industry needs. Key legal victories in the spring by opponents of cap-and-trade and by opponents of EPA climate change rules could have given bidders the jitters. The poor results may have reflected profound uncertainty about the future of cap-and-trade in California after 2020. It may be a week before the results of Tuesday’s online auction are known. “The results from this week are going to be very important,” said Michael Wara, a law expert at Stanford whose research focuses on climate and electricity policy. Wara said that California could continue to pursue aggressive reductions in greenhouse gas pollution even without cap-and-trade. That would make such accomplishments harder, though — at a time of rapidly escalating ambitions. Like others, Wara has been calling on the Air Resource Board to lay out its legal rationale for extending cap-and-trade without the support of lawmakers. He believes a public conversation could help, such as by restoring confidence in the allowance market.